As marketers everywhere are learning, targeted and personalized video ads are an effective marketing tool. While video can cost more than other advertising formats, businesses are finding that video advertising can deliver great ROI. According to a report by Adélie, companies that used video advertising grew revenue 49% faster year-over-year than companies that didn’t use video advertising. With giants like Facebook launching a new video format to drive retail sales and marketing executives predicting the dominance of short video, it’s clear video is here to stay. But the most effective videos are like the most effective ads: targeted and personalized. So how can you guarantee that you’re optimizing your videos for maximum engagement? That’s where machine learning steps in. Earlier this year, Criteo partnered with IDC for an in-depth study on machine learning and compiled the findings in a white paper called, “Can Machines Be Creative? How Technology is Transforming Marketing Personalization and Relevance”. IDC interviewed 459 marketing executives, including CMOs, VPs of marketing, and marketing directors. The report found that while familiarity with machine learning applications is high, with 83% of respondents familiar with it, usage is low, with just 14% actually using it. 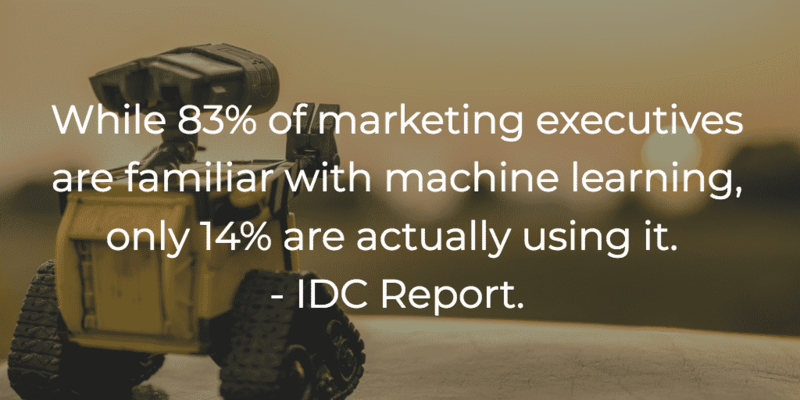 The report found that machine learning marketing solutions are often constrained by lack of internal expertise or technical reasons. Marketers also felt they didn’t completely trust the technology when it came to brand control. However, 33% of respondents confirmed they were planning to invest in machine learning for communications personalization, and a majority 64% of the marketing executives surveyed said that “optimized message targeting” and “real-time personalized advertising insertions” are key areas where machines will deliver business benefits by 2020. Just as with dynamic web or mobile ads, machine learning can greatly improve and optimize video advertising performance. By learning from individual consumer responses to videos, machine learning personalizes content for each shopper’s online behavior. Over time, in this ongoing performance optimization process, machine learning refines and delivers increasingly personalized advertising creative content. This is important because personalization, and personalized video ads especially, are proving to be more important – and effective – than ever. As AdWeek recently reported, pairing compelling creative with personalized content is key to successful advertising campaigns. Seventy-five percent of consumers are more likely to buy from a brand that knows their name and recommends products based on purchase history. On top of that, 33 percent of consumers say they want a more personalized ad experience and would spend more time with ad content that was personalized to their tastes and interests. Machine learning delivers on not just personalization, but also handles all the manual work of data preparation, analysis, and delivery at scale. This frees up creative staff to do what they do best: create imaginative content as a foundation for marketing campaigns. The campaigns in turn are continuously informed by real-time, relevant behavioral data, collected by machine learning. According to the IDC report, 67% of marketers are already using machine learning to generate personalized headlines and advertising copy. 66% are using it for personalized advertising design formats, such as layout, color sets, and sizing, and 58% percent are using it for optimized message targeting. Criteo’s DCO+ – What Is It and How Does It Work? One of the defining features of the Criteo Engine is DCO+, within which sits Interactive Video. DCO+n is machine learning at work. It leverages consumer insights to determine which visual elements be the most engaging to a shopper as well as when to show them. Using client brand guidelines and product feed data, Interactive video generates personalized video ads on-demand for in-stream, out-stream and in-app inventory. The technology uses real-time cross-device shopper insights from the Criteo Engine to personalize ad content with multiple product recommendations, which links directly to product pages. Composer allows a Creative Services team to build a digital design framework in accordance with your specific brand guidelines. By driving a visually engaging design that is consistent with your branding guidelines, the Composer uses a powerful digital design framework that informs every ad’s design. This technology uses behavioral data from 1.2B+ monthly active internet shoppers to increase engagement. By dynamically identifying the optimal design components from Composer for each consumer, RTCO increases consumer engagement for each ad. Using the components identified by Real Time Creative Optimization, Renderer generates the optimal layout for an individual consumer and creates the ad to fit any publisher’s inventory. Renderer also expands your reach across Criteo’s publisher network, removing size and layout limitations, and scaling ads to more than 17 trillion possible design variations. Active Elements makes it possible to serve personalized dynamically designed ads on Facebook and Instagram. Creative components such as product images, logos, calls to action (CTA), text and ratings, are all assembled in real-time for optimized performance, making each ad a unique, compelling and personalized branding experience. Today, consumers are inundated with content. The only way for marketers to effectively stand out is to offer personalized content. Thus, in order to succeed with personalization, marketers must learn to leverage data holistically and go beyond segments and devices. Marketers must look at consumers as individuals to truly understand customer sentiment, as well as where and when they shop. Machine learning can do much of the heavy lifting, not to mention save on costs. Criteo’s DCO+ personalizes one core video ad format that can then be shown to thousands of individual consumers. Machine learning eliminates the need to create thousands of different videos. Instead it offers personalized programmatic video ads, automated with growing precision. As we go into 2018, learning to harness machine should be every marketer’s top priority. These machine learning technologies can create campaign relevance for individual consumers at scale, driving better engagement, deeper connection, and more brand value.